Actually, from my research I guess I’m not so bad off. Many people had many more rows die and when their cars were much younger. But still, mine has gotten bad enough that I can’t read the song title from the radio or the temperature outside. So it’s time for a repair. The challenge in this repair is that the LCD display is not an individual module intended to be replaced but merely a component on a circuit board. And that circuit board contains smarts like the odometer reading and so forth which makes replacing the whole instrument cluster a real pain. (Obviously, if it was easy to update the mileage, there’d be rampant abuse.) In the end, it took a full day and it turned out to be one of the hardest repairs or hacks I’ve done. Fortunately, there is some really good information out there but I got stuck in a couple of places so I thought I’d do my own write up with my own pictures to hopefully help out anyone else who is going to do this. Okay, first of all, many thanks to S4_Raleigh and by extension, MacGyver, both from AudiZine. S4_Raleigh wrote up the great post on the repair using info from MacGyver and that’s what my post here is based on. In fact, I recommend you start by reading that post now (just the first in the thread) before continuing. Next, before starting to pull apart your dashboard, read through this whole post. You may well decide it isn’t for you. And that doesn’t mean you aren’t smart – in fact, you may be smarter to just pay somebody to do the repair for you. Especially if you can live without the car for the few days while the instrument cluster is sent away for repair. There are services that specialize in this work and have relatively quick turnarounds. But I couldn’t find a reliable review or rating for somebody that could turn it around quickly and I couldn’t find somebody near me that I could bring it to. So I decided that I would rather not take a chance on sending it out and be without my car for a few days but you may decide the opposite. I recommend Chip Quik. This was the first time I used it and I agree with the author of the original post that it’s the way to go. The idea is that rather than using regular solder which firms up quickly, the Chip Quik (opposite of the name) firms up slowly which allows you more “open time” with the solder. That’s not normally a good thing but as you’ll see below, it’s really important for removing the old LCD. I got my lead-free Chip Quik from Amazon. And of course, an important item is the LCD itself. If you don’t already know, an LCD works by opening or closing cells with a light source behind it. 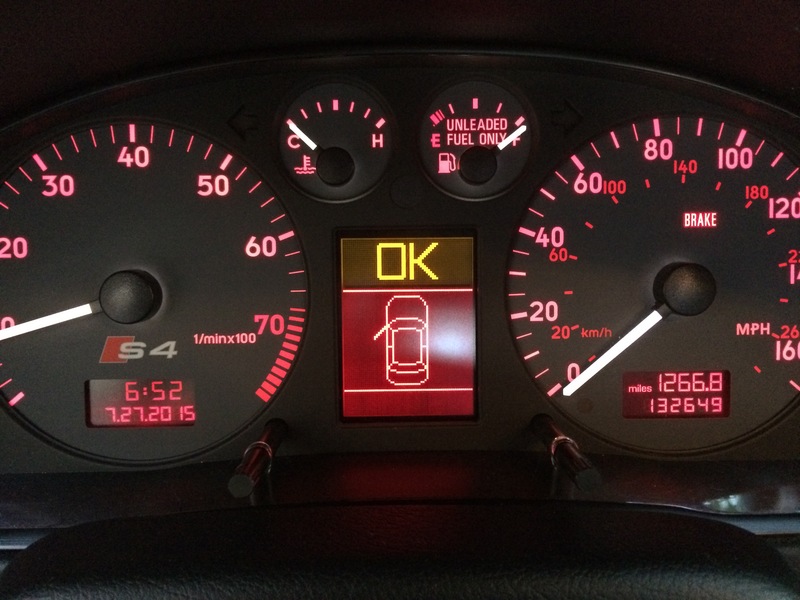 In the Audi instrument cluster, the backlight continues to work properly but the LCD stops open or closing cells on a row by row basis. 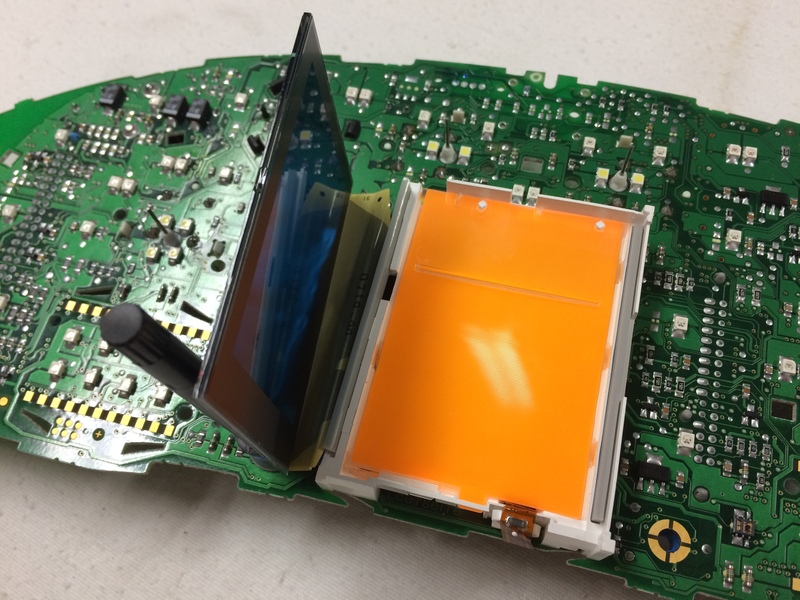 You want to make sure you get an exact replacement for the LCD. From what I read, you can get cheaper LCD replacements that are brighter than the original display – that means that the cells allow too much of the backlight through. You end up with an LCD that doesn’t match the rest of the car and is generally too bright. So it’s important to get a good match and I was very pleased to find that on eBay. But I bought the second to last one so if that listing has ended, you can search for the seller spitzgerald to see if he has a new listing – if he claims it is OEM, it is. Okay, so by now you have your new LCD, the Chip Quik, and the various other items. Here we go. 1. Make a note of the steering wheel height. You are going to drop the steering wheel using the tilt adjustment and if you are like me, you forgot you could even adjust the height of the wheel. Sit in the driver’s seat and note the visibility through the steering wheel to the instrument cluster. For example, you can see the top of the speedo just under the steering wheel arc. That’s where you are going to want to put the steering wheel back to when you are finished. 2. Remove the steering wheel bezel. This part is pretty easy. Adjust the steering wheel to the lowest position using the lever on the bottom of the steering wheel assembly. Then pop off the bezel with your fingers. It just pulls out straight. 3. 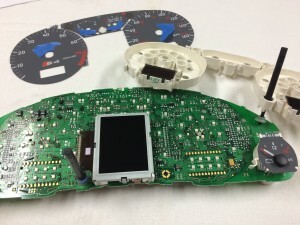 Tape a bendable plastic scrap to the top of the steering wheel assembly. I used the bottom of a cheese stick tray that happened to be just about the same size as the top of the steering wheel assembly. If you aren’t as lucky, cut some paperboard like a cereal box down to size. Wrap the blue tape around two times. I started without the plastic and scratched up the top of the steering wheel assembly almost immediately when removing the cluster. I quickly found the plastic and taped it in place. But I didn’t use enough tape and when I was testing later, the tape let go and the plastic sprung up and surprised the hell out of me. I speak from experience on this step! 5. Open the instrument cluster. Do this by first removing the two Torx T-10 screws on the back. Then you’ll need to pop open all of the tabs at once. You can use the scraps of rigid plastic to do that or I just used an assortment of small screwdrivers. This step is one of the more typical procedures so any way you can get them all open at once, go for it. 6. 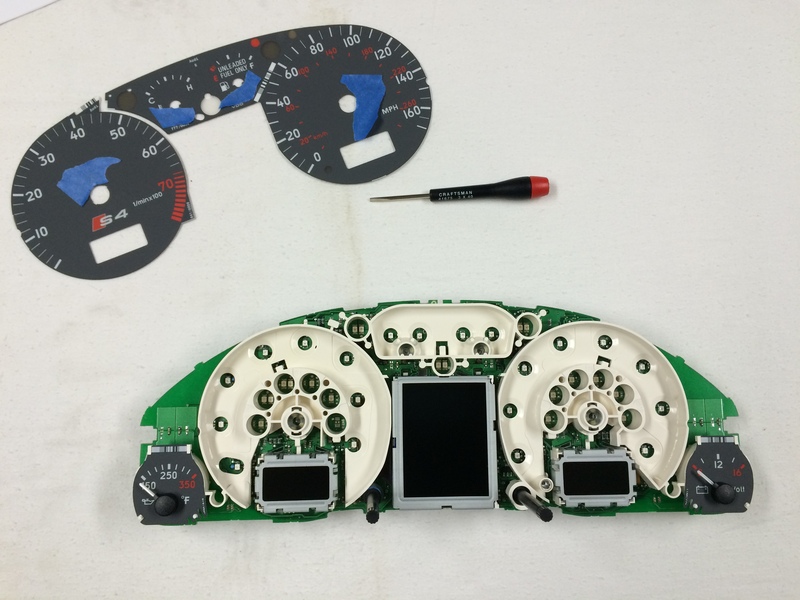 Remove the dial pointers and the display disc, very carefully. I put some blue tape on the disc right at the center dial and that let me use a small screwdriver to gently pry. I read in other places that you should not use a screwdriver but I couldn’t get my fingers under it enough to pull. Maybe some sort of plastic tool without sharp edges that is used for prying electronics apart would work. Or in addition to the blue tape, maybe try some paperboard from your recycle bin. For me, a dull worn screwdriver worked well but just be careful since there’s no undenting a disc if it is bent. Set the pointer aside in a location that you’ll remember which pointer goes to which dial. 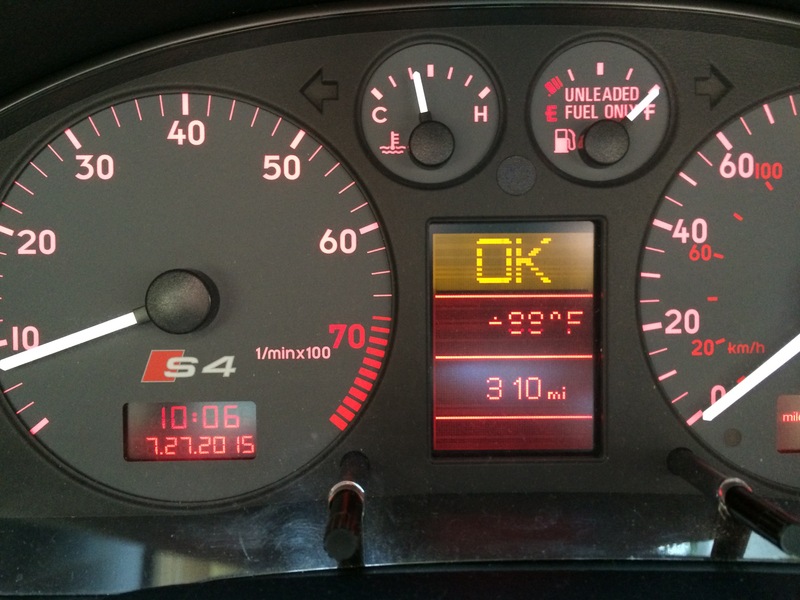 You will need to remove 4 pointers: the coolant temperature (“C” to “H”), the gasoline, the tachometer, and the speedometer. 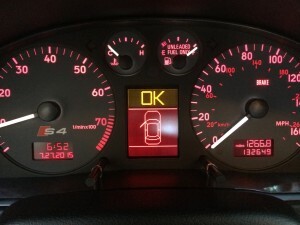 (Do not remove the pointers on the oil temperature or on the battery gauges – they will not be removed.) 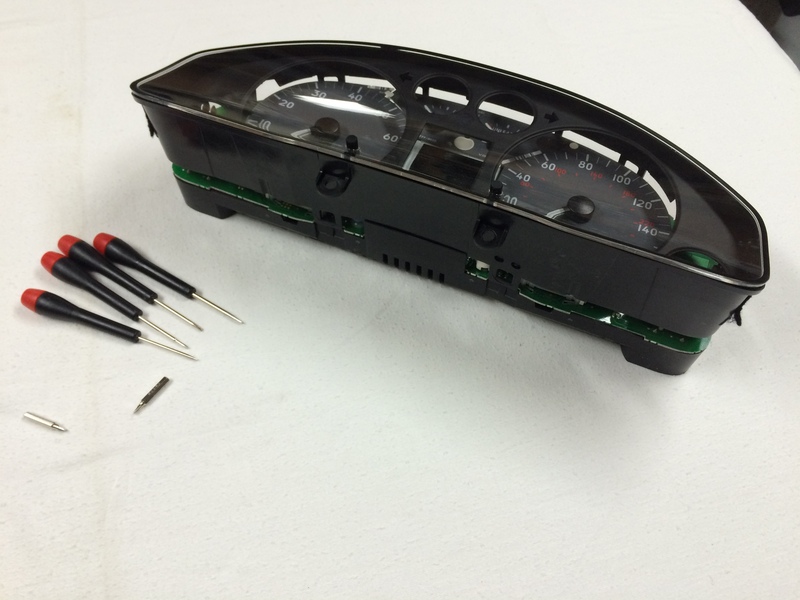 With the 4 pointers removed, you can now lift the tab and turn the tachometer disc and you can simply turn the speedometer disc – both will come off once they have been turned so the holes near the center align with the tabs on the center post. 8. 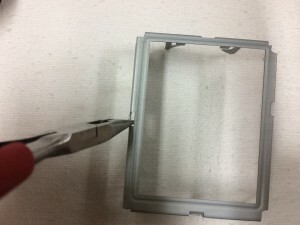 Remove the metal frame holding the LCD over the backlight. 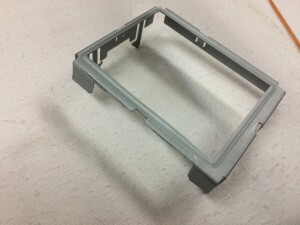 Turn the board over to the back and using needle-nose pliers, bend the four tabs of the metal cage enough that they can push through the board. Use caution here because you are now getting into sensitive areas and don’t want to manhandle anything. Once the cage has been removed, you’ll see that you can now lift up the LCD panel off of the backlight. Keep track of all the parts here. On mine, I had two rubbery strips under the LCD panel and one of them stuck to the backlight assembly while the other stuck to the LCD panel so I had to remove it from the panel and put it on the backlight. I was careful to keep the orientation the same, just in case that mattered. 10. The next hard part – cleaning the board. The idea is that you run the iron over the Chip Quik that remains to keep it warm and then scoop it up with something. The Chip Quik instructions say to use a swab. The only swabs I have are for my ears and they left some cotton bits behind so I’m sure there’s something better out there for this job. I also had trouble when a Chip Quik blob ran away on me and lodged itself on some other connectors. At this point, I got out my desoldering braid and sucked up the errant blob and made sure that the connectors it visited were now well soldered. Then I returned my attention to the LCD trace area and cleaned that up with the desoldering braid. I kept repeating the process until the area looked clean of solder then I used the alcohol pad provided by Chip Quik to clean up the residue left behind. 11. Another hard part – tin the traces. You need to melt a small portion of solder on to the traces – remember you just cleaned up solder that was there so now you need to replace what you removed to accept the new LCD ribbon. Ideally, you want to lay down a small and equal amount on every trace. This is where you get to test your eyes. Even with the lighted magnifying glass, my eyes had a hard time keeping track of where I was. I got into a rhythm by probably the 4th or 5th to last one – figures. 12. 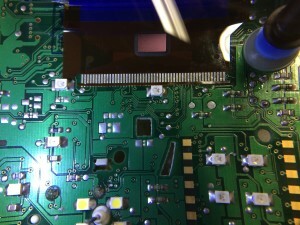 The hardest part – solder the new LCD. Why is this hard? Because there are so many freaking little things to solder. Flux the newly tinned traces on the board. 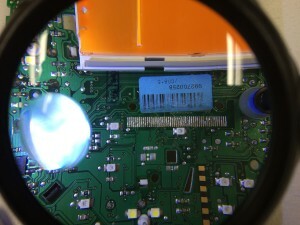 Put the ribbon of the new LCD down over the traces on the board. Pay extremely close attention to make sure that everything is lined up perfectly. I found that the stickiness of the flux helped the ribbon from moving too much but I still had to keep an eye on it. Then I started applying heat to the top of the ribbon. When that area cooled, it meant part of the ribbon was anchored so I could stop stressing about the ribbon moving. Then I could move on to each trace, one by one. I went quickly so I didn’t damage any of the traces. I’m going to interrupt the instructions here to let you know that I had a problem here that I didn’t realize until I had reassembled everything. Even though it looked like the traces were all nicely soldered, they weren’t. I had a few apparently that were missed because the display wasn’t lighting up correctly. 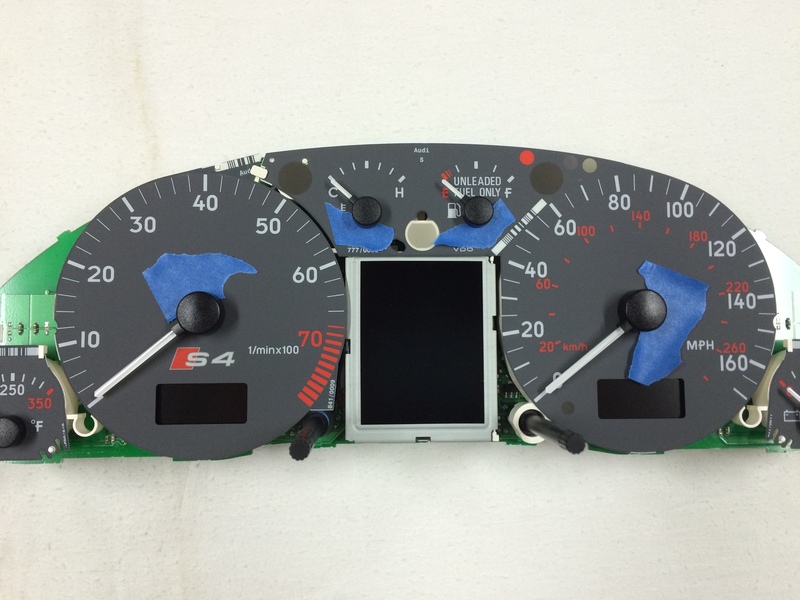 So I suggest that you very gingerly test the instrument cluster in its current state. You will want to hold the LCD over the backlight to protect it (perhaps even use some blue tape to hold it in place). The LCD should still have its protective plastic sheet over it – don’t remove that yet. Definitely do not – I repeat: do not! use the LCD cage at this point. It may seem like a good idea but it is definitely not. 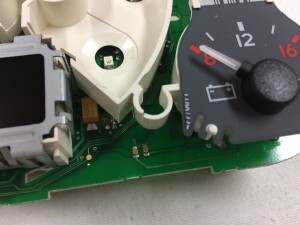 You should be able to carefully get the instrument cluster in the car and hook it up to the three connectors. You will need to actually move the levers on the connectors to get them to engage the contacts though you don’t need to go as far as locking them in place. Turn the car on and check to see how the display looks. At this point, if you got the soldering right, it should look perfect. If you got it wrong, odds are good that the display will be pretty messed up – more than just missing rows – so try moving your finger (not fingernail) over the traces and see if you can improve the display by doing that. When you find an area that looks like it improves things, you can take the display back to the soldering iron and work on that area. I repeated this cycle 5 times before I got the soldering done well. Pausing again from the instructions: So what did I do about the fact that my new ribbon cable was already damaged? The profanity didn’t fix anything. I played around with the ribbon cable while it was connected and noticed that I could get both pixel rows back if I moved the cable around. I figured out what position would work best and I rolled up some blue tape into a sort of squishy stick and placed that under the ribbon. That held the ribbon in the right place even when the cage was reattached. And thus, all rows in the display now work. 14. Reassemble the instrument cluster. Basically, you will now reverse the procedure for disassembly. Start by putting the white plastic gauge frame back on the board. (Note to be careful where it gets close to the LCD ribbon.) Then replace the gauge discs by fitting them over the spindle and turning appropriately. Now put the pointers back on the same spindles they were on originally. You want to simply push them on the spindles but be sure to push them on straight with even pressure and do not push them too far down. You can use the pointers that you did not remove as a guide for how far down to push them. Note that there is no indexing for the pointers so you could theoretically aim the pointer any way you want and end up with wildly inaccurate readings. But all of the dials appear to have positive zero stops that you can use to align the pointers. So I made an effort to not spin the spindles while the needles were off and therefore when I put the pointers back on, they were in the general ballpark of being correct. I then turned the pointer gently counter clockwise until I hit the zero stop. If I went to far, I turned the pointer all the way in the other direction and deliberately turned it too far, then I could turn back again the first way to reset it back to zero. I did find a couple of dials were a little off when I powered up the instrument cluster for a test so I disconnected and adjusted. When the dials are good, reattach the cover by pressing it through all the tabs and screw back in the two Torx screws on the back. 15. Put the dashboard back together. Finally an easy part. Just push the connectors in as you probably already did for testing. This time, make sure each of the connector’s lever locks fully into place when the connector is fully inserted. I noticed that I needed to press extra hard on the connector furthest to the left to make sure the clock and date LCD lit up brightly – that’s weird. 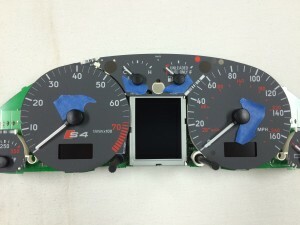 Press the instrument cluster all the way back into place with your fingers and then screw back in the two screws at the bottom. 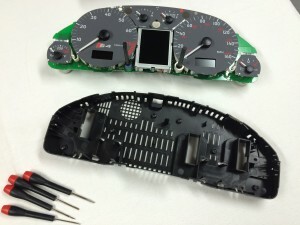 Replace the steering wheel bezel by hooking in the tab on either side and pivoting it back toward the instrument cluster. When you do it right, you’ll hear little “pings” as it snaps into place. Finally, raise the steering wheel back to the original driving height. 16. Success. Power it up and get yourself an adult beverage – you’ve earned it. And as you are enjoying the beverage, leave a comment and let me know if this guide helped you.